Factory made products in all shapes and sizes for creating paved areas. Usually in the open and on the ground. Modern concrete pavers owe their origins to stone paving slabs that have been used to pave roads and footpaths since the dawn of civilisation. For the ones in the photo here no doubt a certain amount of effort has gone into creating an effect to mimic the rustic effect of natural stone. For the most part the modern concrete ones are made in the same or similar factories that make concrete masonry units. They are stamped out on a production line from steel moulds using a very dry mix, and then passed though large heated chambers that accelerate the the curing process. In modern plants the process is highly automated and the quality control of the finished pavers is excellent. 50mm thick (2") pavers and 100 thick (4") concrete bricks of different colours are combined here to create a series of steps. 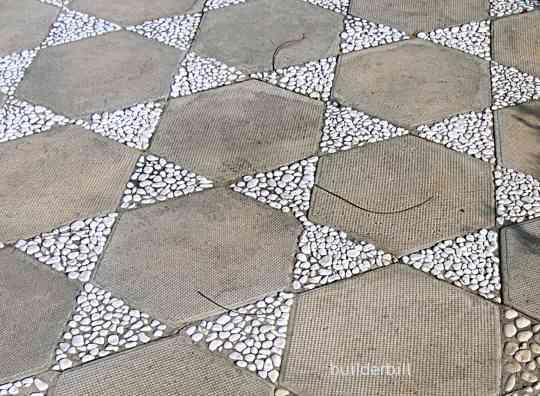 Pavers are a favourite of many designers for their good looks in garden areas. In this particular case the regular watering cycles needed to create a lush green garden have been to a certain extent detrimental to the looks of the cement pavers as efflorescence has formed on many of them. 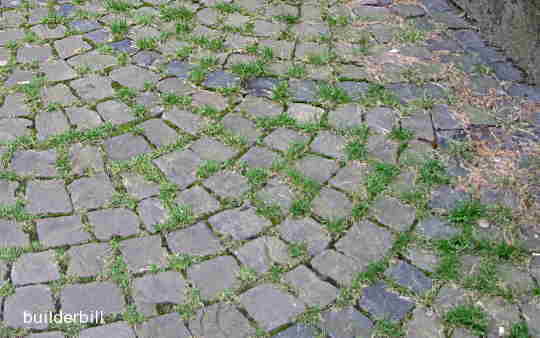 Now these are actually real stone pavers or cobblestones, again in two different colours to set off a traditional fan pattern that is much copied by concrete stencil makers. 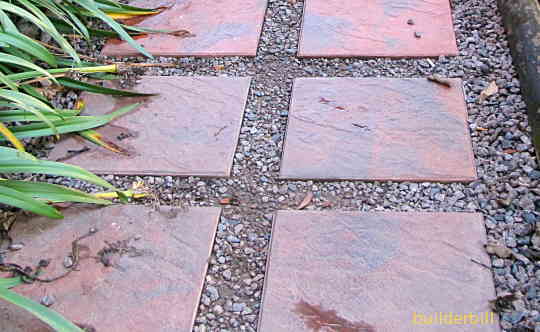 The photo is shown here to illustrate a problem that pavers have over a poured concrete paving slab. The propensity for grass and weeds to grow in the joints. Like most other things in the construction field correct preparation is essential for the final appearance and long life of a concrete paved area. Another variation, pre-cast hexagonal pavers with concrete infill with seeded rivers pebbles.